Is it worth the cash? £249 is relatively cheap for a high quality DAC but it's still a fairly serious investment. For anyone who travels and has to make decisions on headphones, yes it's worth it. High quality DAC. Decent value. Portable. Only those who really need it should consider shelling out. 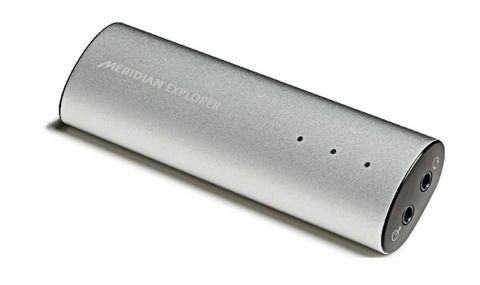 Meridian Audio's Explorer is a portable digital to analogue converter (DAC) for those that need to make big decisions on headphones and on the fly. The quality of digital to analogue converters and amps built into most laptops is somewhat poor. Manufacturers need to cut costs where possible so getting pro audio quality from built-in headphone outputs isn't a priority. "The Explorer DAC and headphone amp is the most portable of Meridian Audio's line-up"
The solution is a better DAC and headphone amp. When it comes to replacements, Meridian Audio is great. The Explorer DAC and headphone amp is the most portable of its line-up. Plug in via USB (plug and play on a Mac, driver required on Windows), then hook headphones up to the headphone socket or use the analogue/optical digital output for a high quality line output. There are no controls on the unit - volume is controlled by your computer. LED indicators show the sampling rate (up to 192kHz at 24-bit). Compared to the built-in headphone out on our MacBook Pro, the Explorer is more accurate, open and revealing. At 50 grams and a fraction over 10cm in length, the Explorer won't weigh you down or take up space.